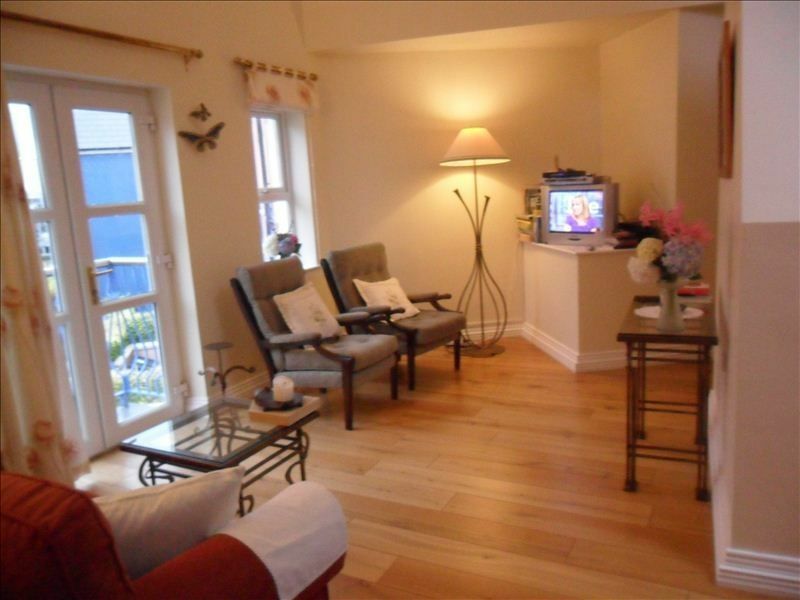 Croi an Bhaile (translated 'The Heart of the Town') on The Wild Atlantic Way is a two bedroom, two bath, en-suite apartment, classified as luxury accommodation, with high ceilings and lots of natural light, giving a spacious and airy feeling. It is furnished to a high standard, is very comfortable and modern. This centrally located holiday apartment retains its wonderful street scape - old world look to those on the outside while it is characteristically modern on the inside. It is on the first floor, with fully-equipped kitchen/dining/living area with balcony to rear overlooking a courtyard, to enable you to enjoy the evening sunset, while the front is accessed via an arched lock up gate. Quality linen and towels supplied at no extra cost. A virtual tour is available on the website below. Rosscarbery is rich in history and tradition. location on the N71 Coastal Route, it is 8 Miles from Clonakilty Town & 12 Miles from Skibbereen Town & Just a mere 10 minutes driving distance from the beautiful village of Glandore known for its sailing experiences. This is the perfect place to relax and unwind. A place apart, where you will be made to feel at home. Located beside the head of a tidal estuary and ideally positioned for exploring the interesting and varied coastline. It is the ideal location for walking, cycling, birdwatching, and relaxing along unspoilt country lanes. Hedgerows support a multitude of birds and wildflowers. while deep-sea fishing, whale and dolphin watching are based in nearby Union Hall. Water enthusiasts will enjoy this comfortable property with its close proximity to blue flag beaches, fishing pier, shops, gourmet restaurants, Burgeoning Craft Shop (stocking all Irish Crafts), and traditional Irish bars. Also on offer in Rosscarbery are: horse riding, golf, pitch putt, golf driving range, canoeing, paddle boats, children’s play ground and tennis courts, Michael Collins Memorial Park, Stone Circles and Ring forts. The world famous Old Head of Kinsale Golf coarse is just 50 minutes driving distance. Bath, hand Towels provided with a fresh basked supplied on alternative days. High Speed Broadband available for lap-top facility. Bicycles available on a daily rate. Rosscarbery Lagoon & activity centre offer boats, canoes & Kayaks at a very nominal rate. My husband and I are from the US and visited Ireland for our first time and loved it! We stayed in suites in 4 star hotels as we traveled from Dublin to Limerick before we got to Rosscarberry, where we spent a few nights at Nora's place. I would take Nora's place over those hotels anytime. I'm so happy that we found her place and was able to stay there. Nora was a wonderful host. We were afraid the town would be too small and we would have trouble finding places to eat, but that wasn't the case. For this tiny town, there are plenty of places to eat and enjoy. Everything we had was very good. We loved everything about this town and the rental. We would recommend it to anyone visiting southern Ireland. Thanks a million Nora!! And thanks for the wonderful scones! They were very yummy! If we ever make it back to Ireland again, we'll be sure to contact you, as I would love to stay there again. We stayed in the apartment belonging to Nora Hubert. Thank you for taking the time out to reviewing "Croi an bháile". It was a pleasure to host you all 3 Ladies / 3 generations. Our family (3 adults, 1 child) stayed here for 6 nights in August 2016. We were delighted with the accommodation; very clean, very well supplied. The village is nice...good supply of handy restaurants, and Rosscarbery is in a good location to visit lots of sights in SW Cork, and Nora gave us suggestions for places to vist as well. Any issues we had with the apartment were very promptly dealt with by Nora. And when our son was unwell on the last day, she was able to extend our stay for another day while he recovered, which was a huge relief for us, and for which we are very thankful to Nora and the owner. So, great location, wonderful hospitality....we could come back here in a heartbeat! Thank you Nora! It was a pleasure to have you as our guests. We always like to" go that extra mile" to help make your visit a pleasant & enjoyable one. We were happy to be of assistance in your time of need. W look forward to welcoming you back again in the not too distant future. Kind regards to all Nora. We just spent two nights here, but the apartment was nice and quaint and Nora was excellent! We were able to get the place last minute and Nora was kind enough to make sure it was ready and even have time to provide us with some homemade scones. We wish we could have stayed another day or two to enjoy the area more. Most of the reviews I see mention how wonderful Nora is and that is completely true. She takes great care of her guests with excellent recommendations on what to see close by. Thank you ladies for your nice review. So glad you enjoyed your visit to Rosscarbery & you felt both welcome & comfortable @ "Croi an Bháile". We look forward to welcoming you back again one day. Our party of four adults stayed in the apartment for five days. We couldn't have asked for a better place for a home base to go to the Ring of Kerry, Clonakilty and Kinsale. We also took in the beaches around Rosscarbery and the Galley Head Lighthouse for fabulous views. Nora provided a comfortable living space, scones and tea on arrival and wonderful conversation as well as many helpful suggestions. We highly recommend this apartment.